A Challenge for every Month! Author theInelegantHorseRiderPosted on January 11, 2014 February 10, 2014 Categories A Challenge for every month, Ethical clothing, Style, Sustainable fashion, Wartime Wardrobe ChallengeTags sustainable fashion6 Comments on A Challenge for every Month! 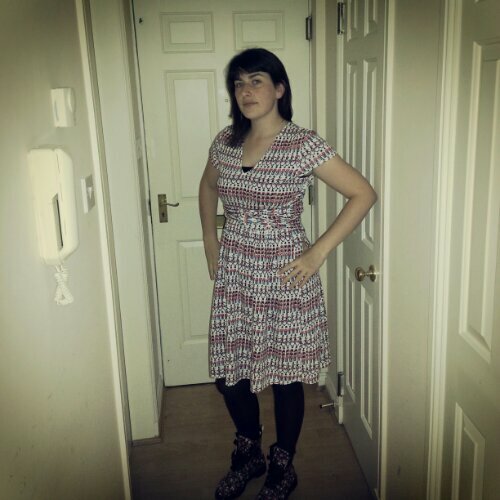 This post tries to give my answers to two questions posed by Ceri from ethicalfashionblog.com and founder of style-is.co.uk, I also thought I would incorporate October’s wartime wardrobe challenge into this post as well. Check out the video for What’s your style at http://youtu.be/p2TFLTyqVDU. Question 1: what is your style? Author theInelegantHorseRiderPosted on November 12, 2013 November 19, 2013 Categories Style, Sustainable fashion, Wartime Wardrobe ChallengeTags style2 Comments on What’s your style? So today is the day, blog action day and I decided to sign up to Ms Wanda’s human-friendly fashion blog challenge. I had been hoping to write about ethical sportswear but unfortunately most of the companies I have emailed haven’t responded yet, that gets to be another post then. So this is my blog post about the importance of human friendly fashion, I hope you enjoy it. The Rana Plaza tragedy back in April of this year gave a horrific worldwide platform to something that has been happening for years. It brutally showed the true reason why fashion has been able to become so fast and so cheap for some. It displayed the cost of the new style of consumerism which is the lives of others and that where lives are not lost there is a world of terrible working conditions, little pay and no job security. I suppose I fail to understand why we want our fashion to do this the lives of others. Now I won’t pretend that I am perfect in my shopping habits, I am not yet satisfied with my wardrobe’s ethics but I have changed how I shop. From the slowing down of my fashion purchases to the focusing of how what I spend my money affects others. I am part of a sustainability challenge this year which has shone a spotlight on my own shopping habits and I have been trying to use my ‘coupons’ on items from ethical and local companies, trying to feel more of a connection to the items I am buying. After all someone made these items and considering my attempts at sewing I am very grateful that they do! It comes down in the end to what we think a skilled worker creating a garment is worth. The more investigating that I do the more firmly I believe that somehow we have got our fashion focus wrong. Why are we buying so many new items that are never worn? Why are the ‘must-have’ tags that rile me everywhere I turn? Why ‘must’ we have it? And more telling why next week is it a different item we ‘must-have’? Behind all of these items is a person working to give us these items, we should have more respect for that. I believe that when people talk of the ‘democratisation of fashion’ – that you can get a piece of fashion from the high street or supermarket incredibly similar to trends on the catwalks within weeks if not days of a show – they tend to forget about the production of a piece. When did we become so disconnected to the items we wear to help express ourselves? The democratisation of fashion only stretches so far it appears. On a positive note though if you do want to enjoy fashion differently there has never been a better time. Between ethical companies and a flourishing second-hand/vintage sector you now have choices unavailable even a few years ago. I want to mention just a couple of ethical brands that I personally enjoy shopping with! Based in the UK and with strong links to Japan is People Tree. A stalwart of fair trade fashion and of my wardrobe it is a company trying to turn our fashion model on its head while producing pieces that are stylish and covetable. This dress is one of the dresses I get most compliments on! Beautiful. Another much smaller company I stumbled across while visiting one of my best mate’s in London. Tucked away in Greenwich there is a shop for Emma Nissim, initially I thought it was just lovely screen prints but delve a little deeper and you realise that the clothes are made ethically and printed in London. One of my favourite jerseys this one! 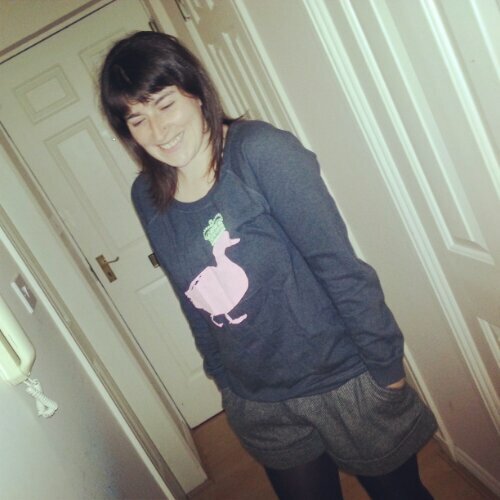 Emma Nissim – Queen Francis Jumper, brilliant fun ethical item. I wanted to mention Traid Remade as well, I have posted this picture of their leggings before for the Wartime Wardrobe Challenge but wanted to mention them again as they were not only lovely to deal with but make all their clothes from discarded fabric and I love that ethos. Finally in my list of companies in today’s post is Rapanui. I cam across this company purely by chance and now I adore them. They are a relatively young company but with great sustainable policies, they have just launched a recycling initiative where you can send them your old Rapanui tshirts to be recycled. That is fantastic in my opinion, it is like full circle fashion – a company that does great pieces and advocates not buying everything then when you are done send it back to be recycled. I like this fashion model. 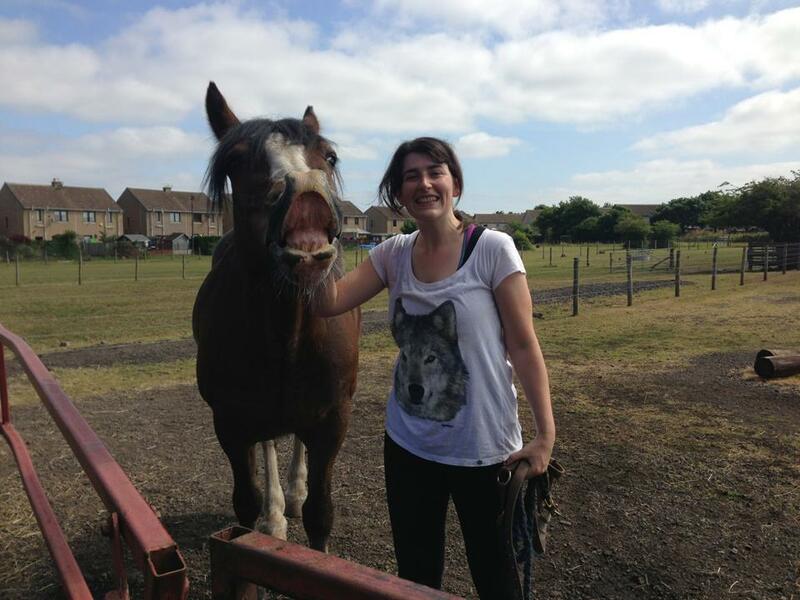 Rapanui t-shirts are suitable for everything! This isn’t even an exhaustive list of the companies I think do great pieces and help push the ethical clothing agenda, there are so many out there. So my challenge to others, before you buy your items from your usual stores why not try to find an ethical alternative? It isn’t difficult and often you can end up with a more unique item you will treasure even more. Slow down fashion consumption (allowing for longer turn around times in factories), pay a little more (and ensure that the money goes to the involved people making the garment) and source from companies who are doing their bit. I prefer to shop away from the high street most of the time but there are bigger brands doing their bit to improve workers rights. (Lucy Siegle at the Guardian has done a great recent set of articles looking at some of the major brands whose clothing is produced in Bangladesh, have a read – interesting stuff). In the end I think we have to all wonder if the item of clothing is worth what we are doing to others in order to have it that fast and at that price? Human friendly fashion folks, it is the way forward! September Wartime Wardrobe Challenge – Oh Dear! So it is that time of the month, time for a wartime wardrobe challenge round-up. This month is the month that I have…..drum-roll please……you guessed it….spent all my coupons! All I can say is wow, I actually didn’t expect to spend all my coupons this year let alone spent them all by September and I certainly didn’t expect to spend the amount on clothing that I have so far this year! I genuinely thought I didn’t spend that much on clothing or do that much shopping, and perhaps I don’t in relation to other consumers but I buy more than I need and I still don’t think my purchases through as much as I should. It is depressing for me to note that had I not spent the money I have on clothes I could afford my funked up single speed (bizarrely I hate fixies, I like free-wheeling me)! So a quick September round up for you. Well after managing not fall foul of the Joules discount shop or the brilliant choice of jodphurs I found in the Lakes while on holiday I was quite pleased with myself. My jodphurs less pleased as on one pair the zip has gone entirely leading to me having to ensure I always wear long tops with those ones or risk flashing my underwear to my fellow riders. My happiness turned out to be short lived as on the 2nd of September I spent 5 coupons on a pair of adidas hi-tops, barely even pausing to remember the ethical question marks over adidas. Basically my old hi-tops were done, my old converse trainers were done – so badly smelling that Mr Inelegant Horse Rider commented on them during breakfast at the hotel we were staying in. 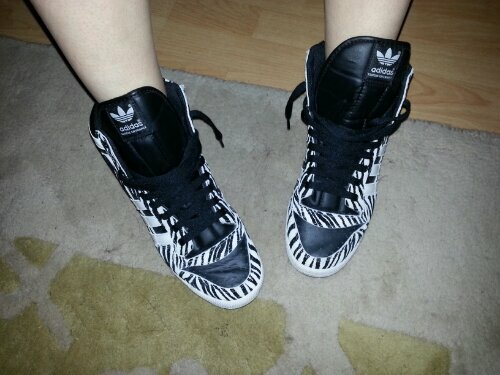 When I found a zebra-print pair it was all i could do to stop myself from jumping up and down with excitement (depressingly I might have actually done this but please don’t judge). So I parted with my cash then paused outside the shop and wondered about what I had done. I love my hi-tops and have worn them a lot but…well come on, I thought I had managed to stop this part of my shopping habits. So other than that, my eBay habit continues. I reckon unless someone changes my passwords that I am just going to have to go on a detox. So that’s it, I have made my last clothing bid on eBay tonight. (I can’t give up entirely just now – a phase out approach). I got a beautiful blue skirt and great green jumper, pictures are below. I decided I want some colour again as it felt my wardrobe was getting a bit grey and black again. 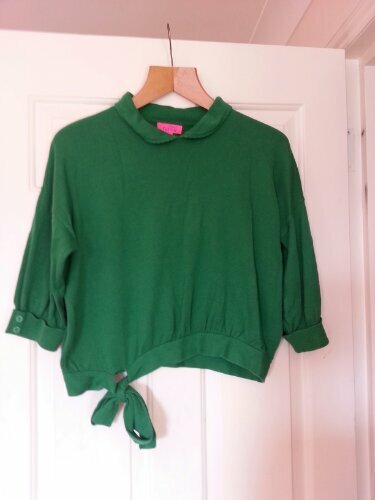 Bright green jumper! Cropped and a bit vintage, 50s style – I love it! Brand new skirt with tags! Top tip read the listings properly. Now I know that the vintage/second-hand market is not going to solve many, if any, of the sustainability issues surrounding clothing but it is still better than buying new. 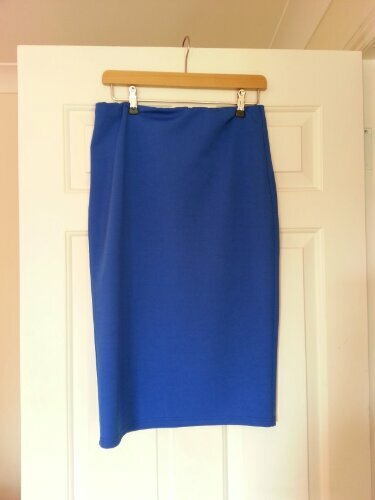 But the blue skirt was brand new with tags! I didn’t read the listing quite correctly, I think I was blinded by the colour 🙂 So now that’s it! In fact I crept into the black market clearly as I managed to spend 0.5 coupons over. September and that’s all the coupons gone! No new running trainers for me (not running so not really an issue) and no new underwear, tights or socks! Vintage and second hand shopping may still occur but I am making a deal with myself, no eBaying but I can still go to the charity and vintage shops. Hopefully this will mean that I enjoy wandering the rails and maybe grabbing a bargain. On another note I have managed to spill sauce all over my bright green dress that I wear when I am off somewhere fancy, let’s hope the cleaners manage to get the stains out as just now I’m not sure what I am wearing to a ball in November – do you reckon anyone would judge me if I went in my pyjamas?? Author theInelegantHorseRiderPosted on October 12, 2013 Categories Vintage clothing, Wartime Wardrobe Challenge9 Comments on September Wartime Wardrobe Challenge – Oh Dear! 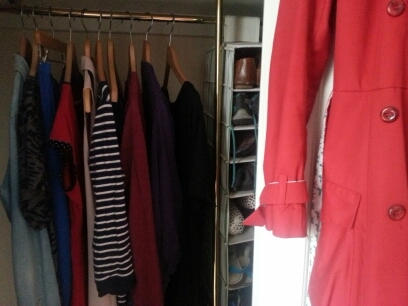 So it is September now and time for the monthly Wartime Wardrobe challenge. Well August turned out to be an okay month for me WWC wise, but that’s only due to my lack of financial planning for the Edinburgh Fringe which always seems to sneak up on me even though it is in August every year for gods sake. Basically shopping was curtailed for “cultural” activities and a holiday in the lake district. However, I have a secret that I want to discuss – I am finding myself becoming slightly stressed by the whole WWC. It is becoming a challenge, and I reckon I am finding more out about myself as a consumer along the way, things that annoyingly Mr Inelegant Horse Rider keeps going ‘Yup, you do that quite a lot’. Now I am not about to blame the WWC for my higher than usual stress levels I had a bit of a low point time with my riding recently and have started a new job so my stress levels are slightly elevated but I have found myself feeling worried about if I buy a certain item of clothing or if I go over my coupons etc. More worrying to me is that I am making wish lists of items that I would buy if I could, I never thought of myself as someone who thinks about buying things so much! I am also feeling a bit out of sorts regarding most of my workwear, this is apparently quite normal when you start in a new job but oddly enough even in items I have owned for a few years I just don’t feel myself. 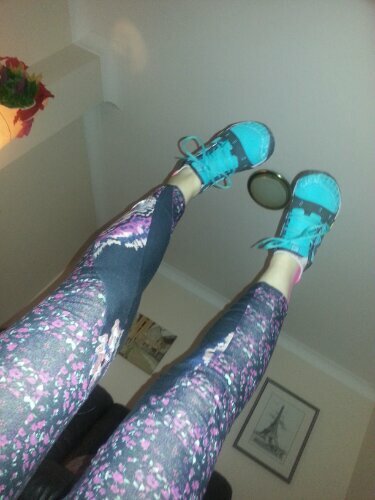 I am finding myself much happier in my jodphurs and tshirts for riding or in my running gear (although I am still only able to run for 20 minutes). Again I didn’t think my clothing effected me quite this much and I suspect that it doesn’t but that it is more in reference to a large change in my life, I was in my old office for seven years and it is quite a shift in office culture to where I am now even though I am within the same organisation. As a final thought before I talk briefly about the purchases in August I wanted to mention fashion magazines. Now I get two fashion magazines a month delivered on subscription, well I suppose one classes itself as a lifestyle magazine more than straight up fashion. What I have been interested to note is that August and September’s issues have both been mainly talking about the Autumn fashion and must-haves, and to be frank it has been getting on my nerves. There are articles telling you not to follow trends but then detailing each trend and where to get them. Various people telling you what you have to buy for this season, what the new coat shape is and if you only buy one thing make it one of these fifty things articles. Now again I would anticipate that part of this is to do with the fact that these articles will not be influencing me in the slightest this year but I do also take issue that these magazines rarely, if ever, reference alternative ways to do fashion. This to me is quite strange as one has a section on street style where people frequently cite items as vintage. I know that this has been discussed endlessly elsewhere and that this kind of opinion is not new but it does make me sad that each month we are still seeing the same thing, also go into any high-street shop and you will find ‘must have’ tags littered around. Sorry for the vague thought there, I will try to get a more coherent post on my ideas together but I just think that with all the journalists, writers, bloggers etc. out there that there must be another conversation that could be had about fashion. Finally as I mentioned above August was a lean month, I purchased a lovely purple dress second hand from eBay and wore it to my cousin’s wedding. A great buy but not sure whether it is quite my style or whether I bought in a bit of a panic. I also bid on a running bum bag by Sweaty Betty, a company who I seem to have a mild obsession with, and won. I felt that I needed something to help keep the extra things I tend to carry when I run long distances, unfortunately not done any long distances to try it out but I remain optimistic that next year I will be able to do my first M-word (not saying it out loud yet for fear of scaring the ankle into giving up entirely). In the meantime I will give it a test run on one of my lovely 2 mile jaunts and see whether it annoys the bejesus out of me. In the main though I have always found Sweaty Betty products to be well made and well suited to their use. 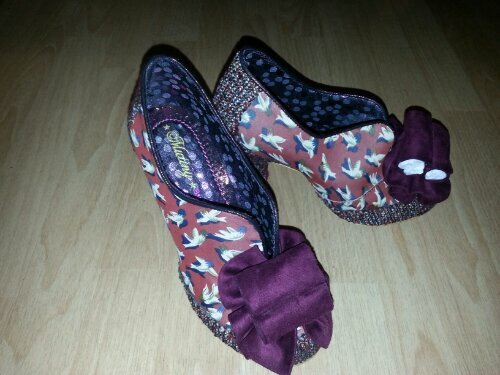 I also was given a pair of shoes by my colleagues as a leaving gift, I need to exchange them for a bigger size although I might have to do a full exchange for different shoes as my ankle was not impressed by the heels on these bad boys! So my question for my fellow WWCers – do we count gifts? I am counting the trousers I bought using the gift vouchers they gave me but do I count the shoes?